The Charter Yacht Brokers Association (CYBA) has announced the 2017 winners of the “Going Green To Save The Blue” campaign, and the crew onboard superyacht NERO have been recognized in the “Designer Water” contest. 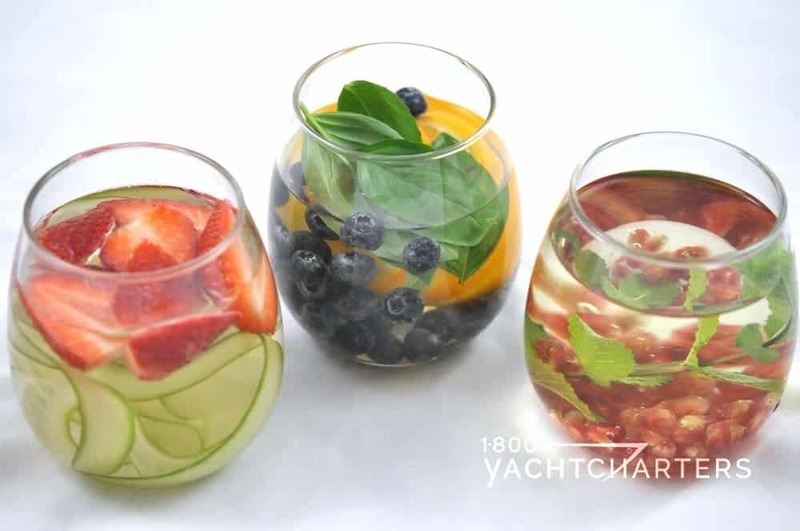 The contest recognizes the crews of private luxury yacht charter vessels for their “yacht-made” water, as an effort to reduce the use of disposable plastic water bottles on yachts. Jana Sheeder, President of 1-800 Yacht Charters, and a CYBA member, explains the program – and the urgency of the underlying message. The “Designer Water” contest is held annually at the opening of the Caribbean yacht charter winter/spring season. The season, which has just concluded for 2017, saw more than one dozen private yacht charter vessels and their crews showcase their “flavored” waters, all generated from onboard watermakers that convert seawater into clean, safe drinking water. Now in its fifth year, the CYBA “Going Green To Save The Blue” campaign has a dual-fold strategy. By encouraging yacht owners and crews to offer eco-friendly options, private yacht charter guests can participate in this sustainable initiative. Hopefully, the guests return home with a clearer understanding of the impact of plastic pollution, as well as how they can incorporate simple changes in their daily lives that can make a difference in safeguarding our environment for future generations. If you’re considering a private yacht charter vacation, turn to 1-800 Yacht Charters, the company with the industry-leading Best Price Guarantee, and a fleet of Eco-friendly yachts around the world. Call us toll-free in North America at +1.800.922.4824 or local and international at +1.305.253.7245 to plan your yachting vacation. For the past 12 seasons, the 63 meter yacht has traveled around the Mediterranean each summer (and the Caribbean in the winter), instantly recognizable with her striking deep blue hull. Now, after an extensive 6-month refit in Spain, including a 3 meter swim platform extension, the Lürssen private yacht charter vessel has turned her image on its head. The blue color is no more…replaced with a shade of white…or is it grey…? 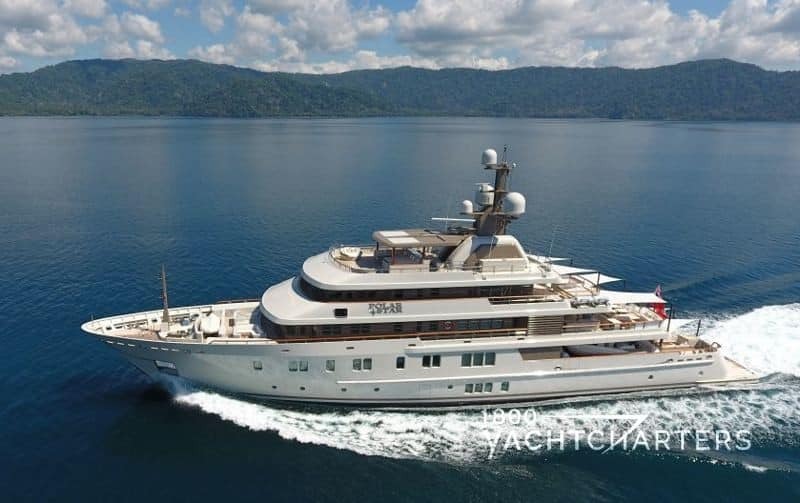 Immediately after the refit, Charl van Rooy, editor of Superyacht Times described the new exterior colors as, “…military light-grey.” Fast-forward to this week, and van Rooy now says it’s a, “…light sand coloured paint scheme.” In fairness to van Rooy, it’s not his fault – the colors are subtle and faint, and depending upon the sunlight, and refection of the water, it does appear to be different shades of off-white. That, of course, is the point. The owner was looking for something fresh – a new image for an iconic yacht that has visually dominated the Monaco yacht charter market for more than a decade. If you’ll be in the South of France this summer, keep an eye open for Lürssen yacht POLAR STAR as she charts a new course and showcases her new colors! We’ll revisit the yacht’s refit in another blog – coming soon. Until then, if you are interested in your own Superyacht Experience in the Med on this or another Lürssen (or Benetti or Feadship or Abeking & Rasmussen or…) yacht charter vessel, visit our selection of Mediterranean yachts for charter at https://www.1800yachtcharters.com/monaco-yacht-charters/ today! Is It “So Long” to 85m Motor Yacht Solandge? 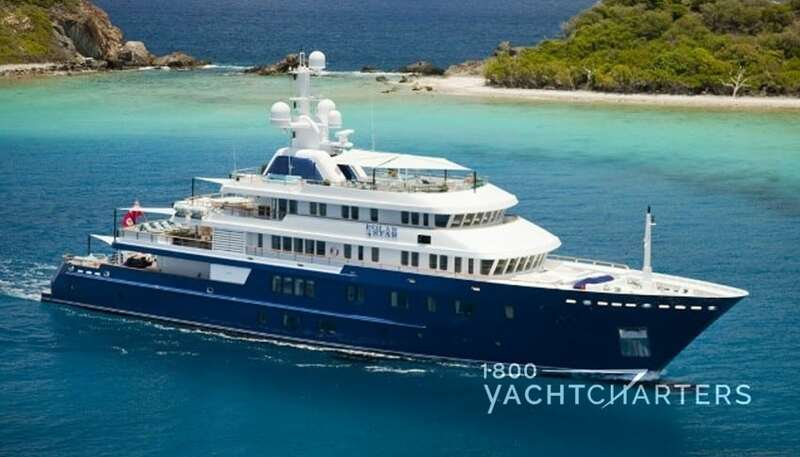 Word recently came in that one of the largest private luxury yacht charter vessels in the market was just sold. The massive yacht was scheduled to participate in the Palm Beach International Boat Show, March 23 -26, 2017. Needless to say, the new owner saw no need to put the yacht on display, instead choosing to enjoy his new watertoy. Launched in 2013, Solandge Lurssen motor yacht features the sleek exterior styling of naval architect Espen Øino, with a rich, rather eclectic interior design by Aileen Rodriguez. Yachtsmen and -women the world over want to know — will we be waving goodbye to Lurssen yacht Solandge…or will she remain in the charter fleet??? Is it Adios – or just Hasta luego? Is it Tchau – or just Ate mais, beijo? Is it Ciao — or Addio? Often, a new owner will remove the yacht from the private yacht charter marketplace, so he and his family and friends can enjoy her for extended cruising. Solandge accommodates 12 guests in a 7 elegant stateroom configuration. Her weekly rate is published at €1,000,000 plus running expenses. Her current schedule has her available for hire in the Caribbean through Spring, then in the Mediterranean for the summer. 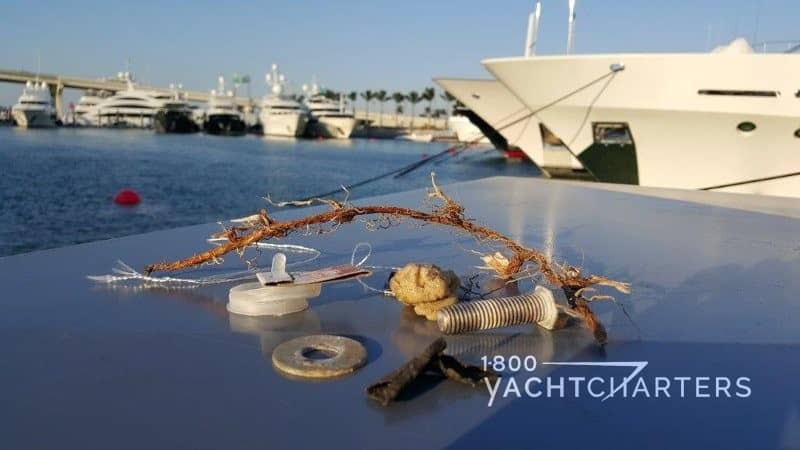 Trash in Luxury Yacht Charter Marinas. It’s Simple to Make a Difference. When I look at this photo, I see beautiful superyachts that serve as a gateway to experience the wonders of our oceans. I see a segment of the tourism industry – private luxury yacht charter – that generates millions of dollars of revenue annually. I see a support network of thousands of crewmembers, dockhands, marina workers, and maintenance and repair staff – all supporting their families from a livelihood that is inextricably dependent upon healthy oceans. For me, the trash in the foreground of the photo is a harsh reminder that the refuse we see floating in marinas and along the seawalls and walkways is a direct threat to the health of our waterways, and therefore, a threat to our own livelihood. As you read this blog, I can guess what some of you are thinking – “I’m not part of the problem – I would never throw trash in the water.” Good intention, ladies and gents, but you or someone you know might still be directly responsible for pollution in our waterways. Efforts are underway to rid our waterways of trash. In Baltimore, Maryland, two (rather cute) trash wheels are pulling debris from the harbor before it flows into Chesapeake Bay. “Mr. 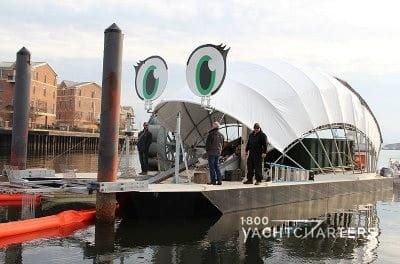 Trash Wheel” (male) and “Professor Trash Wheel” (female with eyelashes) are solar and hydro-powered trash interceptors in place in Baltimore’s Inner Harbor. Over a million pounds of trash has been pulled out of the water by Mr. Trash Wheel since it was installed in May 2014 (Professor Trash Wheel was installed in December 2016). John Kellett (a true ECO-HERO!) invented the trash wheels and tracks the debris collected. Since May 2014, when Mr Trash Wheel went operational, almost nine million cigarette butts and over 300,000 plastic bags have been collected. Additionally, Mr. Trash Wheel picks up an average of 14,000 Styrofoam containers a month – second only to cigarettes. No butts about it! Are you a smoker, or know someone who is? Don’t throw your cigarette butts out of your car window or onto the ground. It takes just a second more to locate an ashtray or garbage receptacle. Say “NO” to single use, disposable plastic products. Reusable shopping bags are available everywhere! They’re affordable and many places give them away as promotional items. Please think twice when your grocer asks you, “paper or plastic?” Say no thank you to either option, and hand your grocer a reusable bag. Many stores give discounts (Target and Whole Foods, for example) when you use them, and you can turn your discount around and donate it to charity, through the store! Be the change you want to see in the world. If you have children, lead them by example when they are young and/or are especially eager to learn. Show them that you refrain from disposable plastic bags… Get them to drink from reusable water bottles and not plastic water bottles. Take them to the beach and show them the pollution that washes up on the shore and share with them how it harm the birds, creatures, and corals in the sea. Track down a video of a sea turtle eating a plastic bag (thinking that it is a jellyfish)…or a seabird or sea lion with a plastic six-pack ring around its neck (which can easily eventually kill the animal). They will follow your lead! What do I hope will happen? 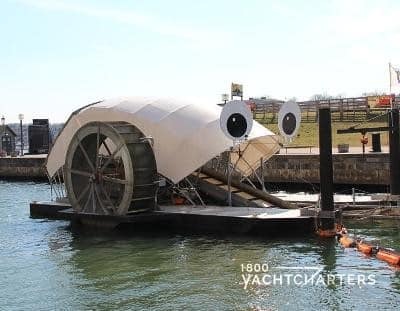 I look forward to the day that Mr. Trash Wheel and Professor Trash Wheel are forced to take days off because there is no debris for them to clean up! 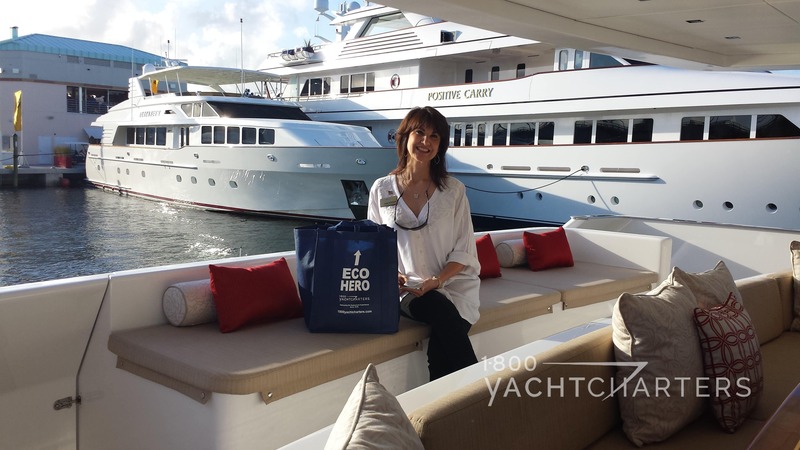 If you are ready to make a difference, text HERO to 305-720-7245 and we’ll send you an “Eco-Hero” tote bag – just like the ones Jana carries with her and also uses at boat shows. It’s Jana’s gift to you – from Jana and our team at 1-800 Yacht Charters! If Spain is hoping to entice more private luxury yacht charter business in the Balearic Islands, they have a funny way of showing it. 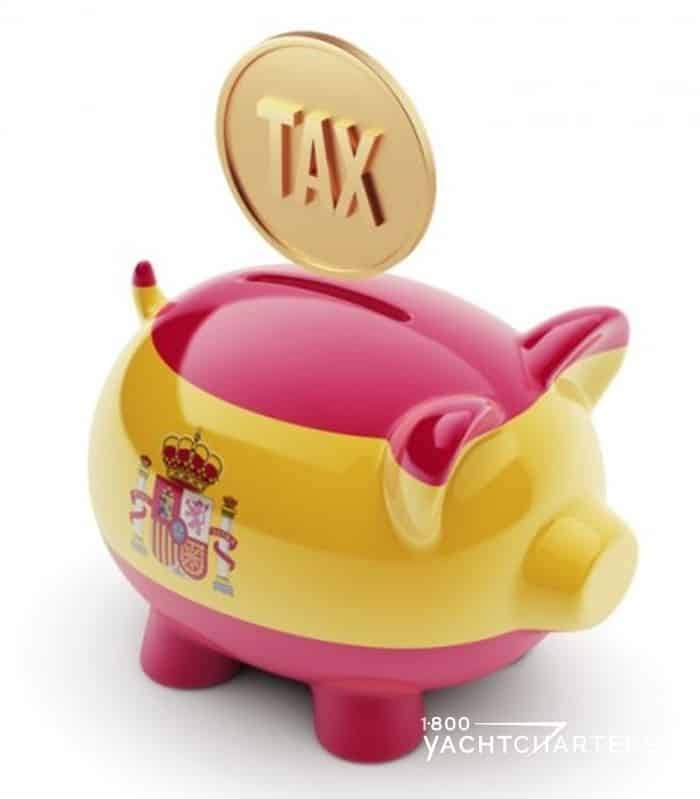 Regular readers of our blog might recall the controversy surrounding Spain’s 13.7% yacht charter Matriculation Tax (blog September 14, 2013). Heavy lobbying by the Spanish yachting and marina industries saw that tax removed. Spain, however, is still imposing far greater taxes on charters than fellow European Union countries like France, Italy and Malta. Case in point – a specific yacht that is legal for charter in both Spain and France will incur TWICE as much VAT liability in Spain, even though the tax percentages are nearly identical! Formula 1’s Eddie Jordan often keeps his Sunseeker 155 motor yacht BLUSH in the Balearic Islands for the summer charter season. When there is demand, the yacht can easily reposition to the South of France for clients who prefer a French yacht charter vacation, even dipping into the coastal areas of Italy and nearby islands of Sardinia and Corsica. The weekly charter rate remains the same between both destinations (€220,000 per week in high season), and the VAT rates are almost identical: 20% in France and 21% in Spain. A client who charters Sunseeker 155 yacht BLUSH in Ibiza, however, will see a tax of €46,200 on his charter agreement, while a client chartering the yacht in Cannes, will incur a charge of just €22,000. So what is the explanation? Why the drastic difference if the tax rates are nearly identical? The answer can be found in Article 58 of European Union Council Directive 2006/112/EC. In our example above, the client who charters motor yacht BLUSH in France, ends up with an effective tax rate of 10%. The client who charters this yacht in Spain pays the full rate of 21%. Note – the tax savings only kicks in when the chartered yacht cruises beyond 12 nautical miles – in essence, into international waters and out of the borders of the European Union. This is a simple task and almost all charter yacht captains will implement this strategy in order to save the charter customer 50% of the VAT rate. However, even if a yacht in Spain sails beyond the 12 nautical mile boundary, the Spanish government still insists on collecting the full VAT fee. (b) consider the place of supply of any of all of those services, if situated outside the Community, as being situated within their territory, if the effective use and enjoyment of the services takes placing within their territory. Paragraph (b) allows Spain to levy VAT charges on certain services that have been provided outside of Spain – if the services are enjoyed inside of Spain. Let’s say a charter starts in Gibraltar. The yacht will need to register for VAT and pay VAT on the length of the charter in Spain (and of course, pass then expense on to the charter customer). By choosing to implement paragraph (b) only, the Spanish government has chosen to only apply the more burdensome element of the directive. Is this the right thing to do to people wanting to experience travel in your country? Like they did with the repeal of the oppressive matriculation tax in 2013, let’s hope the legislators in Spain come to realize a reduction in VAT will make the Ibiza yacht charter market competitive with neighboring France and the rest of the European Union states that derive strong financial benefits from the private luxury yacht charter industry. VISIT https://www.1800yachtcharters.com/yacht-charter-monaco/ for a sampling of private yachts for hire in the Balearic Islands and throughout the Mediterranean this summer, courtesy of 1-800 Yacht Charters.We will be happy to create The Superyacht Experience for you.